For my next fasting adventure I'll be exploring a combination of things. The first will be a 48 hour protocol 2-3 times a week. What does that look like? Day 1: I'll have breakfast and lunch and my last meal will be 6pm. Day 2: I will not eat anything. Day 3: I will skip breakfast and lunch and then eat dinner at 6pm. On fasting days I will drink only water, including sparkling water, black coffee and black tea. I will not add artificial or natural sweeteners. I'll be sure to add a bit of salt to my beverages to keep up my electrolytes. When I do eat, my meals will be made up of 70-80% Fat, 20-25% Protein, 5-10% Carbs, making it a Ketogenic Diet. 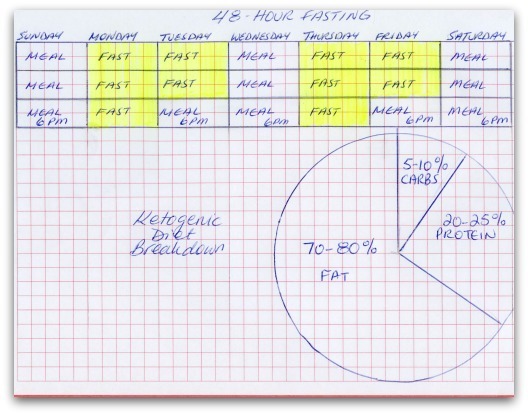 In effect, the plan is to do Extended Fasting with Ketogenic Time Restricted Feeding. I look forward to the challenge!! The next few weeks are filled with appointments and social activities so I'm having to plan out the best days for fasting. I have to think of portable meals as well because I'll be away from home from time to time. I do my planning in an old fashioned paper journal and calendar. I'm an artist and I love the feel of paper and using colorful pencils and markers. I'm not a big fan of tracking Apps, at least not yet. But if you want to track your fasting days there are plenty of Apps to choose from. So that's the plan once I wrap up this 4-week of Time Restricted Feeding. That's it for fasting journal 25! Tomorrow I'll talk about meal planning for success.